After living without master bedroom curtains for nearly 2 years I was ready to do something, ANYTHING, about it, ASAP! I’ve been searching high and low for pre-made curtains or fabric that I loved to turn into curtains for what seemed like forever but I still haven’t found anything I had to have for the money it was going to cost. 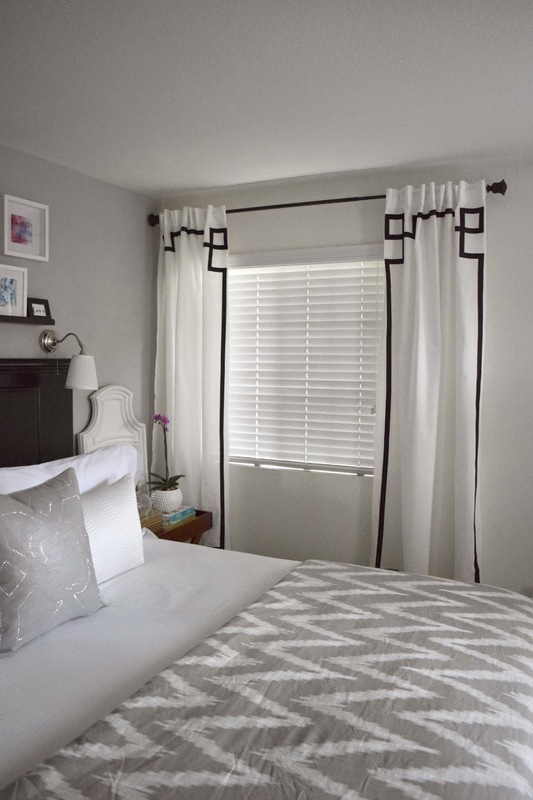 Being that our bedroom has 2 windows and a door leading out onto the patio that all needed window coverings the cost for pre-made curtains or fabric was quickly adding up to the tune of $150+ and because I’m not Donald Trump, I decided to forgo curtains in favor of my wallet. 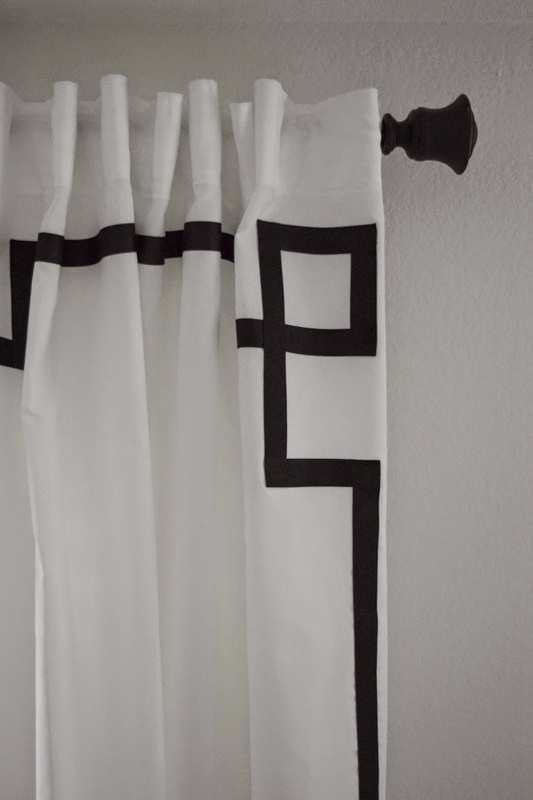 This project all started when I stumbled upon these Vivan curtains during one of my many Ikea trips. And the best part? They’re $10 curtains people! $10!!! Although these curtains are sorta on the thin side and the color choices are limited, for $10 I figured it couldn’t hurt to pick up a pair and see what I could whip up. Into my cart they came and after adding some character, my $10 curtains are here to stay. Once I had my measurements, I added 1″ to the overall length to allot for the bottom hem. If you’re using drapery clips, be sure to take that into account when measuring. The great thing about these Vivan curtains is that they come extra long. At almost 99″ you could hang the rod even higher without worry that you’ll end up with high-water curtains! 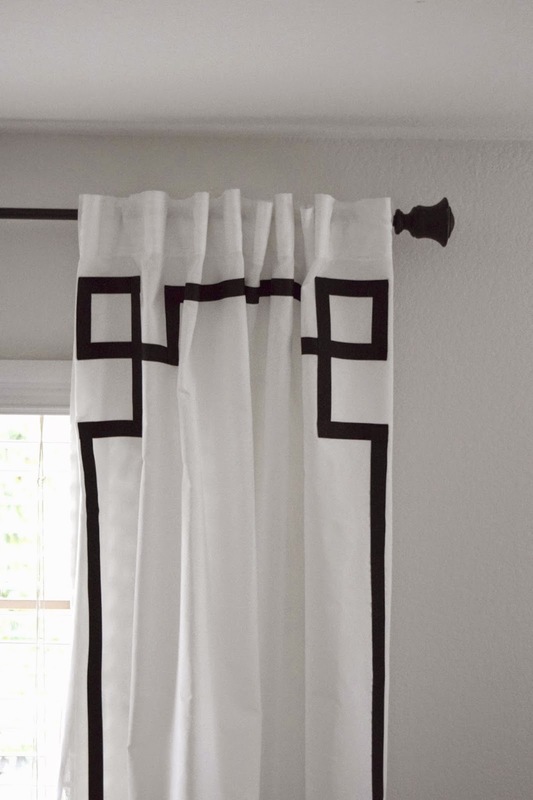 And if you know anything about curtain length, you know that the longer the curtains, the more dollars are flying out your pockets, so at $10, these are a steal! With my measurements and the added inch for the bottom hem, I laid my panel on a flat surface, in this case, the floor, used my measuring tape to measure, and cut to length. Next up…the coolest part of the entire project! And guess what?! It involves absolutely NO SEWING! 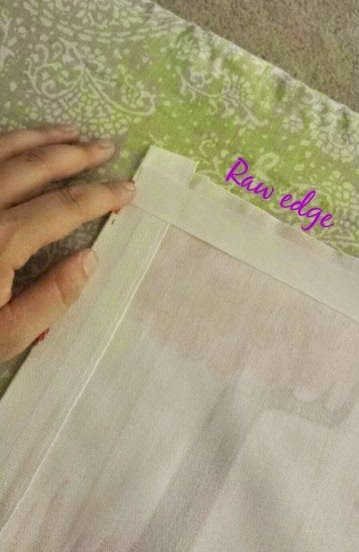 With your unfinished edge, cut a piece of Heat n Bond Hem Tape to equal length of the bottom edge and place it along the raw edge of your panel with the paper side up. Hold the tape in place with one hand and with the other, go over it with the iron. Once the tape has cooled down, peel off the paper, fold over the fabric that now has the hem tape adhered and go over it one more time with the iron. Ta-da! Your hem is officially done and it required ZERO sewing! If you’re at all apprehensive about how well a no-sew hem will hold up, let me tell you, do not worry your pretty little head! 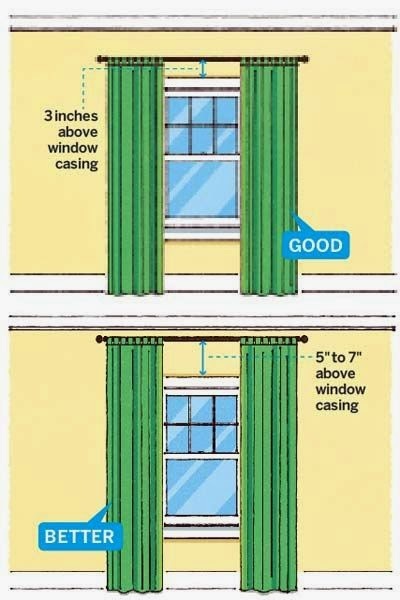 I’ve used this same method to hem my living room drapes and even after several washes, it’s held up beautifully. At this point I hung up my newly hemmed drapes and lived with them for a few weeks but the plain white curtains were just ho-hum boring and I just wasn’t in love. 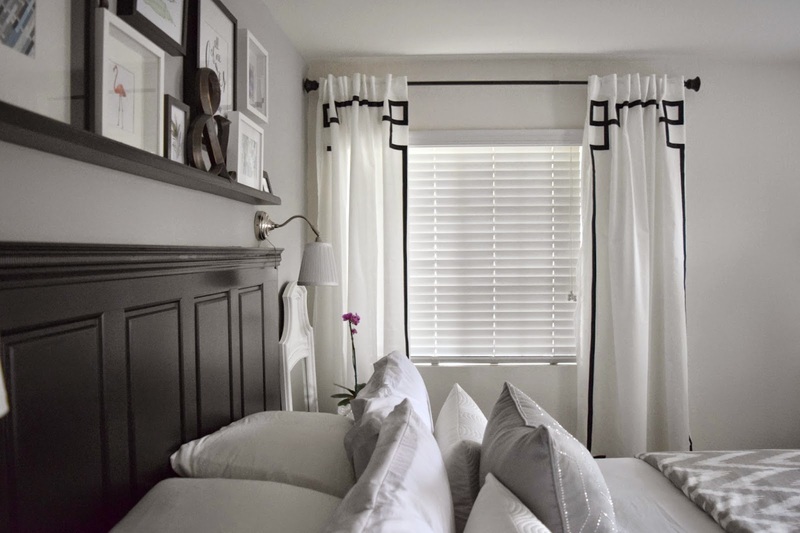 So after searching the interwebs I stumbled upon this blog and after seeing that she used the same curtains I had just hemmed, I thought adding some ribbon the way she had was the perfect solution to my very boring drapes. After I cut all my ribbon and hem tape, I ironed on all the hem tape in the same manner described above and then used a lighter to seal each of the ends. This step isn’t necessary but for added durability and to prevent your ribbon from fraying, I suggest taking the time to do this. 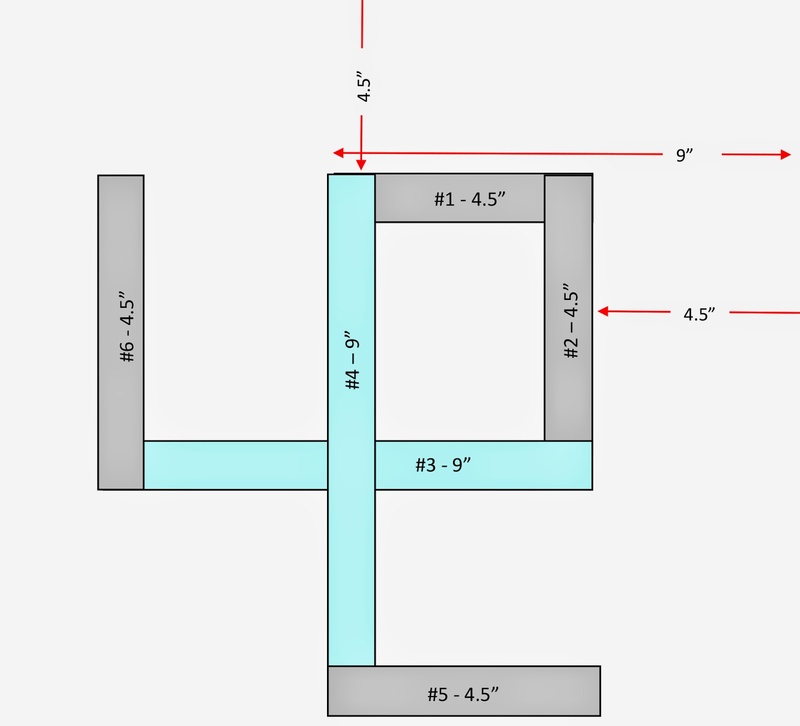 To determine placement of the ribbon for your Greek key design I simply measured inward 9 inches and upwards 4.5 inches from each corner of the curtain panel, placed my first ribbon and ironed over top. After I placed my 1st 2 ribbon pieces, I just eyeballed the placement per the diagram below, made a few passes with the iron over each ribbon piece until it was in tacked down. 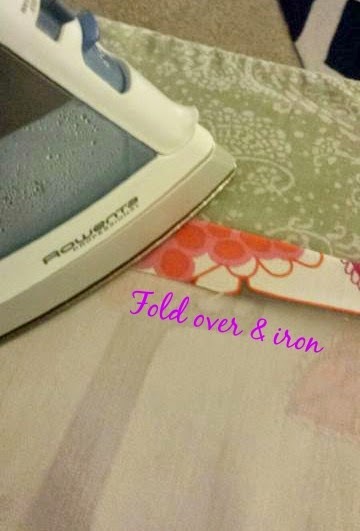 After going over the ribbon with your iron, the ribbon will be hot. Do not touch it. Once the ribbon has cooled down, it will firm up and the glue will have taken hold. The diagram below will better illustrate how, where, and in what order I placed my ribbon cuts. I did all four corners first before connecting the tails. 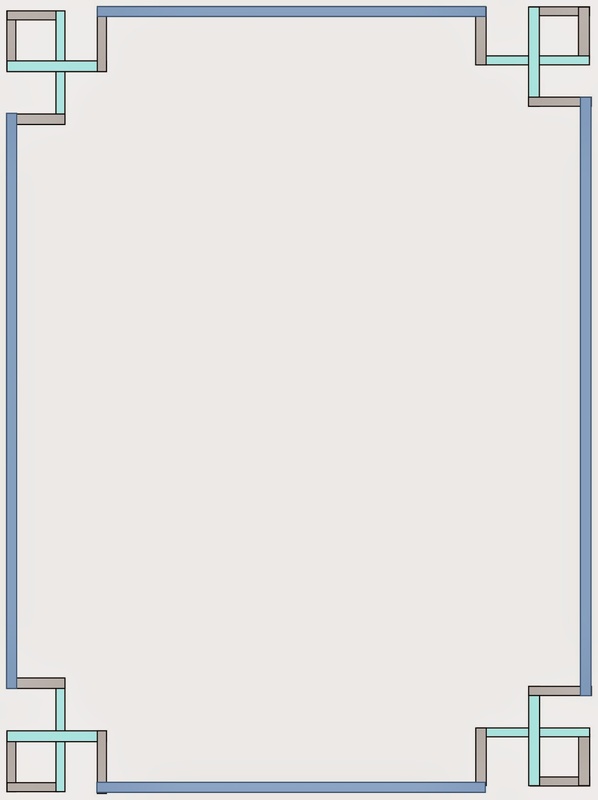 Once all your corners are done, connect all your tails as shown in the diagram below (blue lines). And wa-la! 3 hours later, 1 panel is done. You think I’m kidding, or at least hope I’m kidding…well I’m sad to say that I’m not! Let me tell you…this project is so, so simple but it is tedious and time consuming. Just a warning! The 2nd panel only took me about 2 hrs so that’s a plus! But they sure are purdy! Let’s take a look! You can’t really tell in these pictures, which is the my point exactly, but I didn’t go the extra mile and miter my corners, I just simply overlapped the ribbon and being that it’s black on black, it blends seamlessly and you cant even tell that I took a little shortcut! After living without curtains for nearly 2 years, I think these are the perfect addition to our bedroom! Even if they did take me 5 hours to make, I’d still do it again, I love them so much! You just cant beat that price! Being that I have 2 windows and 1 door that needed coverings that means it cost me right around $50 for the entire bedroom! How awesome is that?! 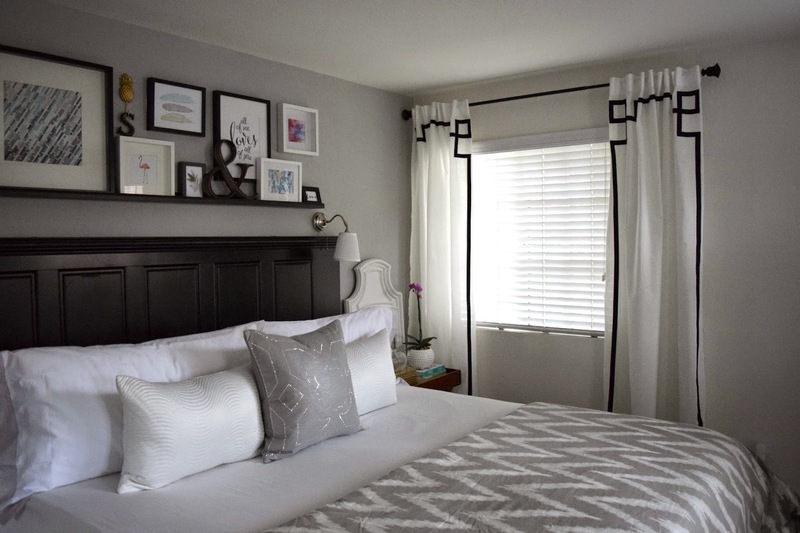 And after seeing how great these no-sew curtains turned out, my little brain is swirling with tons of ideas on how to embellish plain-ole curtains with a little ribbon and heat bond hem tape. What do you think? Will you give these a shot, or create your own unique design? I’d love to know!